Amazon deservedly has a reputation for a wide selection of products at great prices. But getting the best deal isn't as simple as choosing the seller with the lowest price. With a wide variety of sellers in the Amazon "marketplace," it pays to be an educated consumer. Especially around the holidays, unscrupulous vendors inflate the retail cost of items to make it look like you're getting a big discount when you're really getting ripped off. I've seen popular toys going for 2x or 3x times their true retail price! And other sellers may have high shipping fees or unfriendly return policies, like high restocking fees or no returns at all. Fortunately, there are ways for you to easily spot the true deals without hours of research. Before you go shopping, read our 9 recommendations for saving money on Amazon. If you find an item on Amazon and you’re hoping the price will fall later, consider the Honey plugin for Firefox, Safari, Opera and Chrome. Once installed, you'll see two Honey buttons. One will show up that shows if there are any price changes. The second button lets you sign up for alerts when the price drops over 30, 60 or 90 days. Look carefully at who is selling and who is shipping the item you want. An item may be shipped by Amazon on behalf of another seller with a returns or exchange policy that is different from Amazon’s—and not to your liking. Items that are both sold and shipped by Amazon will be tagged as eligible for free shipping via Amazon Prime (Amazon Prime costs $99 pre-paid for the year or $10.99 per month). Free shipping is often available if you're willing to wait. And, if you're a Prime member, you can select No-Rush Shipping for rewards, which include Prime Pantry, Kindle ebooks, Amazon Instant Videos, Digital Music, Amazon Appstore apps, Digital Video Games, Digital Software titles and more. The rewards aren't much, usually a couple of dollars, and you don't get to choose your reward, but if you really don't need your shipment within the next 6 business days, why not? If you're a last minute shopper, Amazon Prime's free two-day and, in some locations, same day or even 2-hour shipping can save you a bundle on express shipping costs. If you're just looking to expedite shipping for the holidays, subscribing for a month will cost you just $10.99 (versus $99 for the year), and for that time you'll get all of the benefits of Amazon Prime, including access to free videos, music and ebooks. 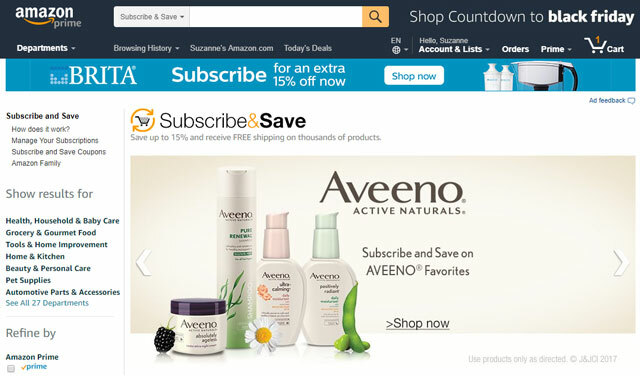 If you buy things like coffee, dish soap, dog food — really anything — on a regular basis, you can sign up to have the item shipped on a regular basis through Amazon's Subscribe & Save program. Refills can be scheduled for as often as you need them, from every month to every six months. You save 5% when 1-4 items are shipped in a month and 15% if 5 or more items ship. Amazon Prime members can save 20% off the purchase of diapers and baby food when they have 5 or more subscriptions. All subscriptions must be sent to the same address on the same day to qualify. If you're a frequent Amazon shopper, you may want to get the Amazon Prime Rewards Signature Card. You'll get a $70 Amazon gift card when you're approved and then an ongoing 3% back on your Amazon purchases, or, if you're an Amazon Prime member, you'll get 5% back on your purchases. However, be prepared to pay off your card every month or else your savings won't offset the interest you'll pay every month.